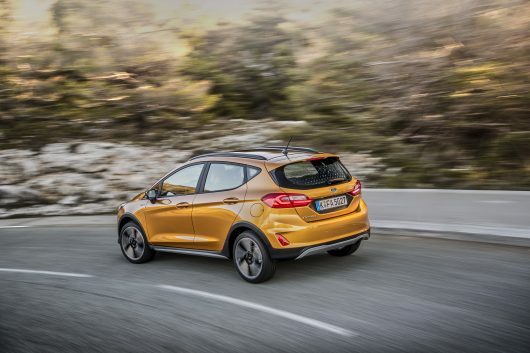 Banking on the success of their Fiesta, Ford has introduced a new model to its portfolio, the Fiesta Active. They’re calling it a crossover, it’s more of a midway to crossover between the Fiesta and Ecosport. 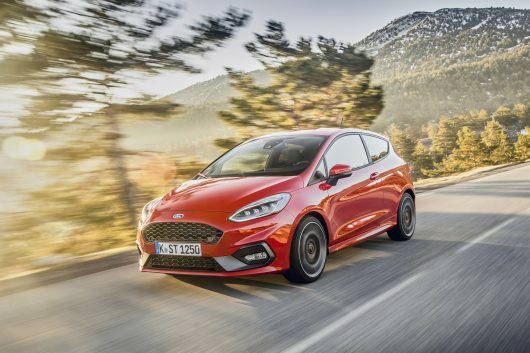 To differentiate it from the regular Fiesta, the Active is dressed in matt black cladding, it rides 18mm higher than the regular model, with a 10mm wider track and higher profile tyres on 17-inch alloy wheels. The contrasting black roof works with the lux yellow launch colour of our test car. 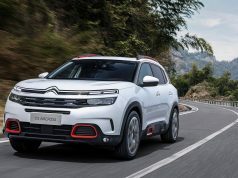 It seems that if you don’t want a small SUV or crossover, here’s a car that will tackle potholes and car parks more proficiently than a standard car but without the body roll of an SUV. 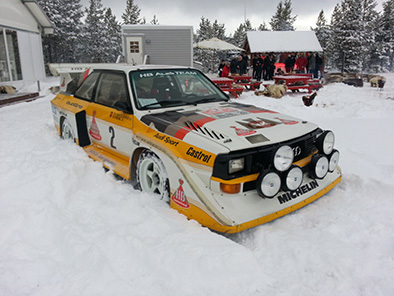 I say car parks because don’t be fooled into thinking this is an off-road vehicle, there’s no four-wheel drive option, instead you have drive modes (Normal, Eco and Slippery) which alter the car’s stability programme to allow more slip on gravel tracks and loose surfaces. The front shock absorbers feature a new hydraulic rebound stopper to smooth out bumps, along with unique knuckle geometry for the suspension. 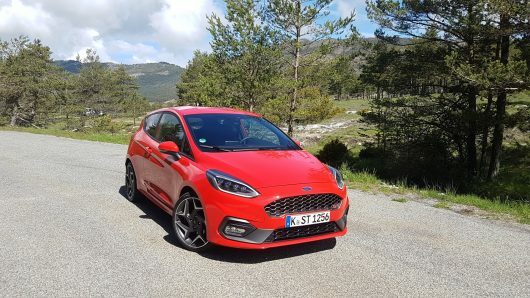 The ride is a bit softer than the regular Fiesta, yet still steers accurately and has a competent chassis beneath it, you can enjoy the twisty hill climbs above Nice, along our test route. Our test car did benefit from the 140-horsepower variant of the 1.0-litre Ecoboost three-cylinder petrol engine which came to fruition on the steep gradients above the city. 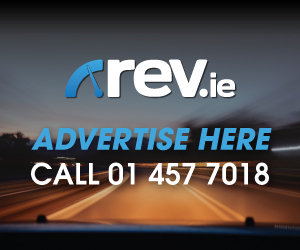 Irish motorists will only be offered a 100-horsepower model across two grades, Active and Active 2, when the first cars arrive in June, priced from €21,900 and €23,200 respectively. Some of the equipment highlights on the Active grade include, 17” alloy wheels, rear privacy glass, silver roof rails and rear LED lights. The Active 2 premium adds some additional exterior styling elements along with a B&O play premium audio system, 8” touchscreen, cruise control, auto high beam, driver alert and traffic sign recognition, rain-sensing wipers and auto-diming rear view mirror. 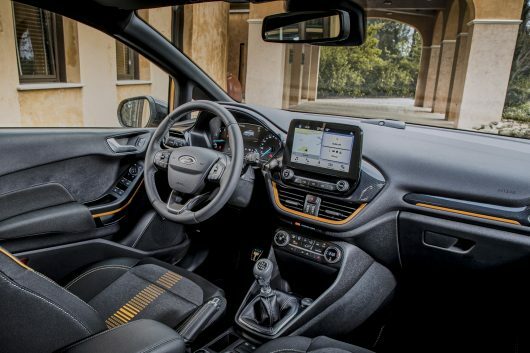 The interior is comfortable and functional, Ford’s design team has thankfully reduced the number of buttons and switches by 50 per cent over the regular Fiesta to give a clean fresh look to what was a somewhat cluttered setup. Front seat occupants are treated to quality sports seats which offer lumbar support for the driver and four-way adjustment for driver and passenger. A leather steering wheel, gear knob along with satin aluminium detailing complete the class appearance of the interior. A host of additional safety systems are available, these include pre-collision assist with pedestrian detection, traffic sign recognition, auto high beam, adaptive cruise control, blind spot information system, lane keeping aid. The Active also boasts a coveted 5-star safety rating from Euro NCAP. Ford SUV sales were up 24 per cent in 2017, almost one in five of every new Ford vehicle sold in Europe, with the EcoSport, Kuga and Edge. 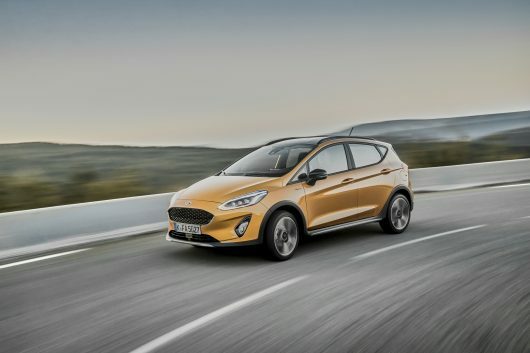 The Fiesta Active is the first of a few new midway to crossover models that Ford is introducing, soon customers will be able to purchase a Focus Active and Ka Active too. 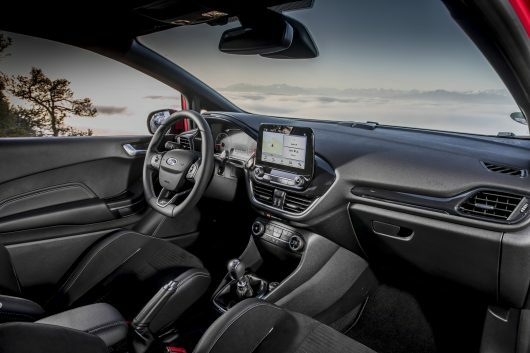 I couldn’t quite appreciate the appointment of the Fiesta Active at first, however it’s more attractive to a Fiesta with easier access, a premium level of specification and a more comfortable ride. 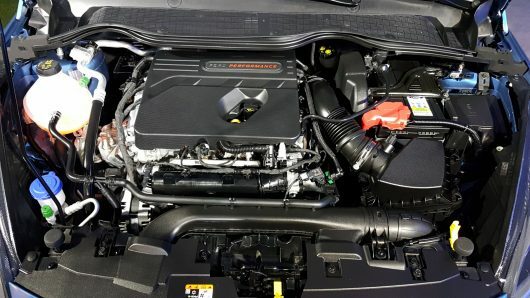 We look forward to testing the 100-horsepower variant of the 1.0-litre Ecoboost petrol engine when the car arrives in Ireland next month. Coinciding with the launch of the Fiesta Active, Ford held the European launch for its pocket-rocket Fiesta ST. The roads along the Col de Vence, in close proximity to Monaco and Nice, proved to be the perfect test route for this hot hatch, providing an abundance of fast-flowing turns, hairpins and straights, the only thing better would be to have had a closed section of road. The ST’s road holding is phenomenal, the pace at which you can turn-in and accelerate through a corner is mindboggling. The optional Quaife mechanical limited-slip differential, along with Ford’s patented force vectoring springs certainly contribute to its race-car-like handling. Ford’s performance division have truly excelled themselves with the Fiesta ST, it’s a long time since I drove a car at launch that impressed so much, on so many fronts. 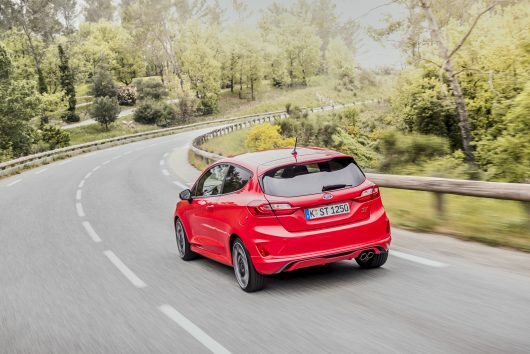 You might not win many hands at top trumps with the Fiesta ST’s seemingly diminutive 1.5-litre three-cylinder turbocharged Ecoboost engine. It’s the smallest engine to ever feature in a fast Fiesta, even the XR2’s were 1.6-litres. Fear not though, cause this gem of an engine produces the most power of any Fiesta, 200-horsepower and 290Nm of torque to be exact. Ford’s performance division made the correct decision to mate this to a six-speed manual transmission. 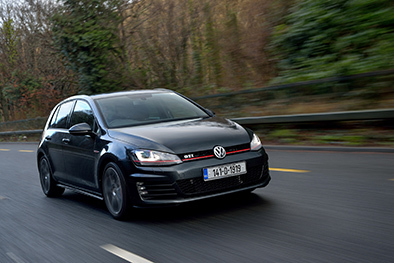 The combination of the power-to-weight ratio, handling and close-ratio manual gear changes truly creates a car that feels like an old-school hot hatch, full of driver involvement and engaging to drive. 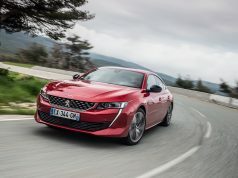 There’s a pleasing soundtrack from the three-cylinder engine and twin exhaust, it sounds more akin to a five-cylinder engine and emits a grin-inducing pop on upshifts. This new Fiesta ST sits 50 millimetres lower on newly designed 18” alloys. The large rear spoiler not only looks the part, it increases downforce too. 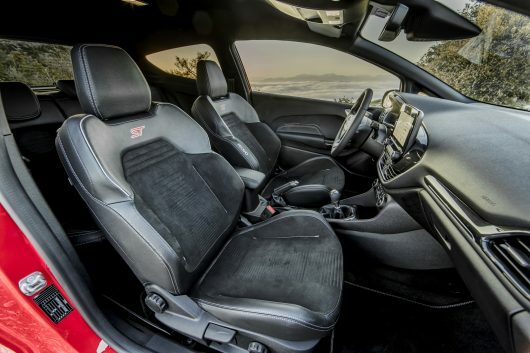 There is a notable improvement to the quality of the interior over its predecessor, it has a more upmarket feel. The infotainment system is excellent with a crystal-clear screen. Front seat occupants are cosseted in Recaro sports seats which hold you firmly in place for some spirited driving. With a central driving position and steering that communicates what the road wheels are doing, you really feel part of the car. This ST has the fastest steering rack and stiffest torsion beam yet to be fitted to a performance Ford. It has three different driving modes, Normal, Sport and Track. Sport gives you a bit more noise with a more reactive accelerator and steering response, Track has less intervention from the traction control, allowing you to induce some lift-off-oversteer. The only minor gripe I have, is that the throttle pedal is too far away from the brake pedal, making heal-and-toe downshifts extremely awkward. 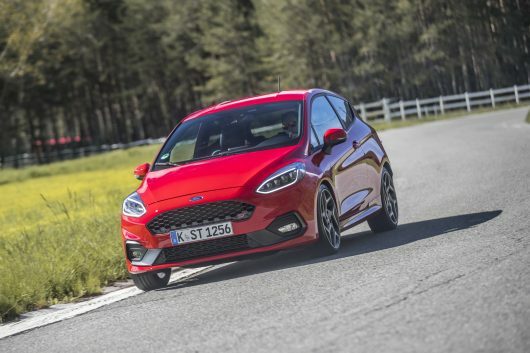 The new Fiesta ST will arrive in Ireland this July, it will be available in two versions, ST 2 and ST 3 in three and five door body styles, with prices commencing from €28,120 and €30,270 respectively. Its competition will primarily come from the recently launched Volkswagen Polo GTI, Peugeot 208 GTI and Renaultsport Clio. 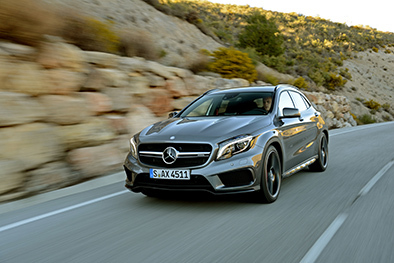 From our initial test it has plenty of accolade to compete with the stiffest of competition. Now, we just need to find our own Col de Vence in Ireland to take the Fiesta ST for an extensive drive.